In our choreography class we all worked on individual pieces of movement and then performed them to the group. 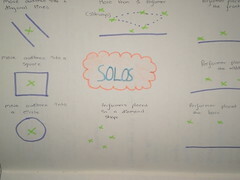 However, in performing them we explored the many positions that we can start in when performing a dance. It was intriguing to see the difference in a performance that is danced to the back of the room, as opposed to the front. We then played with the idea of moving the audience to suit the performer. For example the audience could be placed in a square, in a circle or into two diagonal lines. I really enjoyed this exercise as it emphasised how important it is to pick a spot that will best reflect your dance and draw in an audience at the same time.